Sometimes, all it takes for strangers to become friends is a common desire to care for the least. Like many, the LBC-GK partnership came to be in the most common and traditional of manners in GK’s 10-year history: with a referral and an interest to volunteer. Monica Araneta (President of LBC Foundation) wanted to try a GK house build and was looped in by a friend who was then volunteering with GK’s football program. Monica’s initial interest led to an organized LBC volunteer activity, and a year and a half later, this interest has blossomed into a genuine friendship between LBC and GK, two institutions aspiring to build a better Philippines. LBC Foundation (LBCF) is the Corporate Social Responsibility (CSR) arm of LBC Express, the leading express courier and remittance service in the country. Founded in 2001, it aims to make significant contributions to nation-building in the areas of education, environmental rehabilitation and protection, health, community development and disaster preparedness and relief. From the very start, Monica Araneta and Nena Wurthrich (Development Head of LBCF) have been deliberate about providing as many employees with opportunities to develop and embrace a social consciousness. More importantly, they have been deliberate about signaling to the whole LBC family how serious they were in pursuing their nation-building agenda. 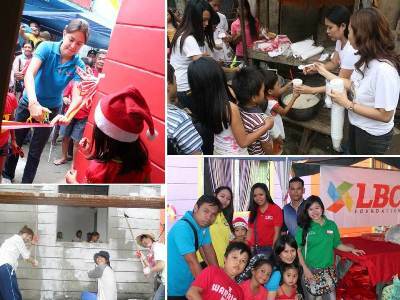 In September 2011, LBCF piloted a host of volunteer activities running simultaneously in not just 1 but 5 different provinces: Isabela, Manila, Batangas, Cebu and Butuan. complementing an extremely high volunteer turnout of around 60 Manila-based employees. LBC Local Business Unit team leaders worked with GK counterparts, and most of those that joined were first-timers who appreciated GK beyond a housing program and whose eyes were opened to the little acts of caring they can do for the less privileged. 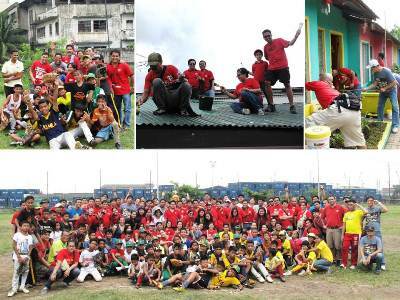 In the end, it became a bonding activity for the teams in as much as it served the GK communities. And everybody it is. Just recently, KAYA Futbol Club (the football team sponsored by LBC) and Team LBC spent an entire day in GK Trece Martires, Cavite to build homes and play football with kids from nearby GK communities. Everyone had such a good time that by the end of the day, promises to be back had already been made. In LBC’s 60 years of existence, they have done one thing best: bridging people and communities. Their core business allows people to send and receive love in the form of letters, balikbayan boxes and money remittances, and it is with the same that LBC has proven itself to be a strategic and instrumental ally of GK, most especially in the critical times of Operation Walang Iwanan. LBC representatives visit the Bayanihan sa Iligan Village. During the Typhoon Sendong and Pablo relief operations, LBC took care of transporting to CDO, Iligan and Davao Oriental the clothes, medicine and other relief items dropped off by donors in Gawad Kalinga’s Manila Headquarters. More than that, LBC representatives from Manila, CDO and Iligan actually made it to the Bayanihan sa Iligan Village to help paint homes last January 2013. Not only did they get to interact with those who received the relief items, but LBC’s presence also showed the typhoon victims that they truly care. As LBC now says, “Ang hari ng padala, may padalang Kalinga.” When organizations built to raise profits begin to make sacrifices this way, something must be in the right. 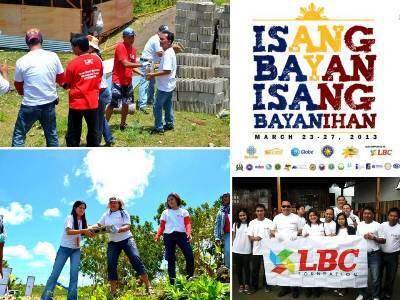 Last March, LBC was in bayanihan with the rest of the Philippines during the Bayani Challenge 2013: Isang Bayan, Isang Bayanihan, held in 37 locations nationwide. LBC was a Major Sponsor and was present in ten sites – building homes, planting trees and mangroves, spending time with children and conducting coastal clean-ups. The idea was to inspire heroes out of seemingly ordinary citizens and endorse solidarity as the only real solution to the country’s poverty crisis. As next year’s Bayani Challenge yet again dares the impossible (300 sites), it would be an honor to have LBC’s army of 6,000 employees nationwide with us as we scale up and impact more lives. In this mutual quest of nation-building, challenges along the way are inevitable. 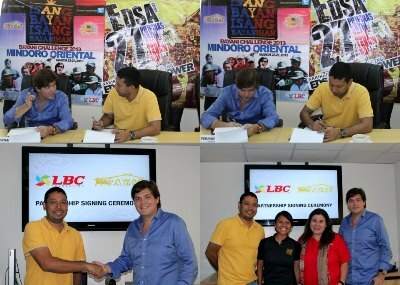 And as the LBC-GK friendship deepens, so has the demand for greater commitment and more active involvement. When we opened this year’s Bayani Challenge, two new LBC-GK Villages (one in San Remigio, Cebu and another in Cateel, Davao Oriental) also broke ground. Not only will this give decent, clean and safe communities for at least 60 more poor families, but it will allow LBC to share the GK Way further and spread the culture of caring and sharing throughout the entire organization. With these communities, VisMin-based LBC employees can give their time and pour out their hearts in the same way that NCR-based employees continue to give their hearts to GK Baluarte. When LBC Express Inc. President Fernando Araneta and Gawad Kalinga Executive Director Luis Oquiñena formalized the agreement for the two villages in early March, both parties knew it would not be the last. As early as now, talks about an HR recruitment plan that provides the poor with real chances for employment have already begun. This is no longer just about a common desire to care for the least. 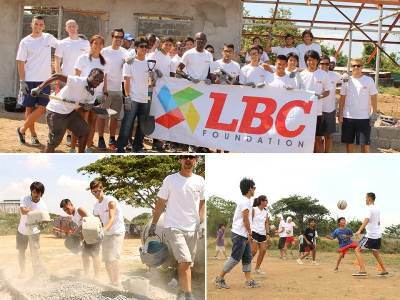 What started out as corporate social responsibility (CSR) activities wherein LBC and GK discovered and pursued mutual interests is now a deepening friendship – one that has allowed LBC and GK to grow in the mission and take on challenges side-by-side, with individual employees investing their personal time and striving to live out the GK Way. And true to the spirit of “Walang Iwanan,” friends won’t leave you behind, in good times, in bad and onto 2024. Friends are in it for the long run – the full marathon. Or as they say in football, the whole nine yards. After all, when two institutions become friends, the relationship is not time-bound and the possibilities become endless. Gawad Kalinga is not a charity, rather, it's an organization that aims to end poverty by building empowered and productive communities. This would not be possible without the partners who have journeyed with us in changing the lives of others. Like LBC Foundation and LBC Express, you too can be a hero to the poorest of the poor and partner with us in making sure that no one is left behind. Walang Iwanan!